This section gives an overview of the court process in consumer and debt matters. Client asks for help in starting a court action, or, having advised the client that they should take a matter to court, you want to explain the court procedures. Client comes to you with court documents indicating that a legal action has been started against the client. Aside from dealing with the merits of the case, you want to explain the court procedures. Client explains that they cannot afford a lawyer and want you to help in court or at least give some advice about court procedures. Client wants to know how much a legal action is going to cost. It is beyond the scope of this publication to go into detail about court jurisdiction and procedure. There is a large body of statute law, court rules, and case law on this subject. This section gives an overview of the court process, relevant to advising clients. A number of sources of information on court procedures are listed at the end of this section. Substance: Refers to the merits of the case — whether the client has a claim against someone else, or, if the client is a defendant, whether there is a defence to a claim made against them. Procedure: Refers to the court processes necessary to resolve the merits of a case. Almost all legal actions in British Columbia will be started in either Small Claims Court or Supreme Court. In a very few instances, not covered here, an action may be started in the Federal Court of Canada. Small Claims Court and Supreme Court are commonly called trial courts, because that is where trials of claims are heard. The key resources for understanding the processes in these two courts are the rules prescribed for each: the Small Claims Rules and the Supreme Court Civil Rules. When starting a legal action, the first consideration is which court it will be launched in — in other words, which court has “jurisdiction” (the legal right to act in or judge a case) over the matter. Rules often dictate this, but sometimes it is a matter of choice. In most consumer and debt actions, the main factor governing jurisdiction is the dollar amount of the claim. Here are the main factors to consider for each court. This is an online system that encourages a collaborative approach to resolving disputes. Handles most small claims actions up to $5,000. Deals with most types of consumer and debt cases (section 3.1(1) of the Civil Resolution Tribunal Act). Does not have jurisdiction in specific types of claims, such as claims for libel, slander, malicious prosecution, or against the government (section 3.1(2) of the Civil Resolution Tribunal Act). Has monetary jurisdiction over actions up to $35,000 (excluding costs and interest). Most claims up to $5,000 are dealt with by the Civil Resolution Tribunal. Deals with most types of consumer and debt cases (section 3(1) of the Small Claims Act). Some causes of action (for example, libel, slander, and malicious prosecution) cannot be brought in this court (section 3(2) of the Small Claims Act). Some statutes specify that an action can be brought in this court. For example, section 171(3) of the Business Practices and Consumer Protection Act states that certain actions under that Act can be brought in Small Claims Court. Procedures are easier to follow than in the Supreme Court, so the plaintiff (the person making the claim) may not need a lawyer. If the amount the client wants to claim is over the $35,000 limit, it may be to their advantage to consider reducing the claim to the maximum allowed to start the action in Small Claims Court, where they may not need a lawyer. Note that if a client pursues this option, they cannot start another action for the difference between the upper limit of the court and the amount owed. Has monetary jurisdiction over any amount of money being claimed. Claims within the monetary jurisdiction of the Small Claims Court may be started here, though there are disadvantages. Procedures are more complicated than in Small Claims Court, so the plaintiff will probably need a lawyer. If the plaintiff uses a lawyer for claims that could have been brought before the Small Claims Court, the plaintiff is almost always barred from claiming compensation for legal fees. A client’s immediate concern is usually what chance they have of successfully commencing or defending a legal action. This is an assessment of the merits of the case and includes explaining how much clients will get if they win or how much they will have to pay if they lose a legal action. Legal costs are the costs of having a matter resolved in the court system. These costs include fees payable to the court, lawyer fees, and expenses involved in the litigation. Assessing what the legal costs will be is probably as important as advising clients on the merits of the case. First, clients often have no idea about lawyer fees or court filing fees, or are misinformed about what to expect. Second, legal costs often prove to be a major factor in a client’s decision on how a matter is to be handled. Court fees: Court fees are what the government charges for people to use the court system. For example, in Small Claims Court, it costs a claimant $100 to file a Notice of Claim where the claim does not exceed $3,000. Disbursements: Disbursements are the expenses associated with carrying out the legal process and include having legal documents served, photocopying costs, and fees for expert witnesses to testify at trial. The law usually allows a successful litigant (a person involved in a legal action) some compensation for their legal costs from the other side. For example, if a party is successful in making or defending a small claims action, the Small Claims Act and Small Claims Rules permit a judge to add to the judgment the successful party’s court fees and expenses that they consider are directly related to the conduct of the lawsuit. As well, the Small Claims Court can order a party or witness whose behaviour causes unnecessary expenses for another party to pay all or part of those expenses. The Small Claims Rules also allow the court to impose a penalty of up to 20% of an offer to settle against a party who refuses a settlement where the judgment of the court is ultimately equal to or less than the amount offered by a defendant, or equal to or more than the amount offered by a plaintiff. The Small Claims Act does not allow any recovery of lawyer fees in Small Claims Court actions, regardless of the outcome. Successful parties in Supreme Court are generally awarded some compensation for their lawyer fees as well as for their court costs and disbursements. The amount of compensation, however, is a complicated issue. Very roughly, a successful litigant can expect to be compensated for one-third to one-half of their overall legal costs, including lawyer fees. The following are some of the basic procedural considerations in a legal action, up to the time of trial. Time limits are crucial in court procedures. There are consequences for exceeding a time limit for doing something. For example, a judgment may be entered against the defendant. The most important time limits involve filing pleadings, including defence documents. In a matter before the Civil Resolution Tribunal, a respondent must provide a Dispute Response Form to the tribunal within 14 days of receiving a Dispute Notice (Civil Resolution Tribunal Rules, Rule 72). In Small Claims Court, a defendant must file a Reply in the court registry within 14 days after the plaintiff’s Notice of Claim is served on the defendant (Small Claims Rule 3). Under the Supreme Court Civil Rules, a plaintiff files a single document called a Notice of Civil Claim and a defendant must file a Response to Civil Claim. A defendant must file and serve the Response to Civil Claim within 21 days of being served with the Notice. In Small Claims Court, the pre-trial processes are minimal. The main step is a settlement conference. This is an informal hearing where both parties meet with a judge to see if some or all of the substantive and procedural issues can be resolved by agreement instead of going to trial. In many cases, there may also be a formal mediation presided over by a mediator (note that a mediator is not a judge and cannot make a judgment on a case). Such sessions are generally held before the settlement conference. 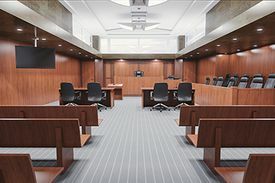 In some cases, a trial conference must be held before the trial. Consult the Small Claims Rules 7 to 7.5 for details. Discovery of documents: A requirement that each side produce relevant documents for inspection by the other party. Examination for discovery: Pre-trial questioning of opposing parties by lawyers. Perhaps the most difficult aspect of court procedures for clients to understand is how evidence is presented at court. Some rules of evidence (guidelines on what type of evidence is allowed) arise in common law, others in statute law, and still others under Small Claims Rules and Supreme Court Civil Rules. Small Claims Rules give wider latitude (they are more flexible) in presenting evidence and even specify that a judge may conduct a trial without complying with the formal rules of procedure and evidence (Rule 10(1)). The party bringing the action (the plaintiff) is responsible for proving all elements of their case to the judge on a balance of probabilities (which version of the case is more likely). To advise clients on court processes, you should have current copies of the rules for the Civil Resolution Tribunal, the Small Claims Court and the Supreme Court. This page was last edited on 13 October 2018, at 09:41.